For our second interview as part of our focus on small ship cruising, we spoke to Jonathan Moffatt, Sales & Marketing Manager from Hebridean Island Cruises. Sailing around some of the most remote parts of the Scottish Islands, their main ship, Hebridean Princess, carries only 50 passengers. Those fortunate enough to go on a Hebridean Island Cruise will be able to see tiny islands, remote villages and stunning scenery, plus much more. Q. 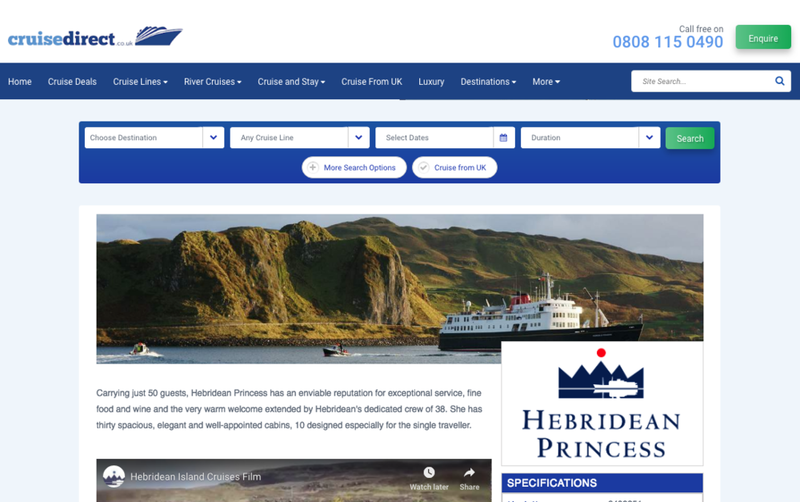 - What does Hebridean plan to achieve in the UK, and how does making it easy to add in your ship, itinerary and pricing information feature in those plans? 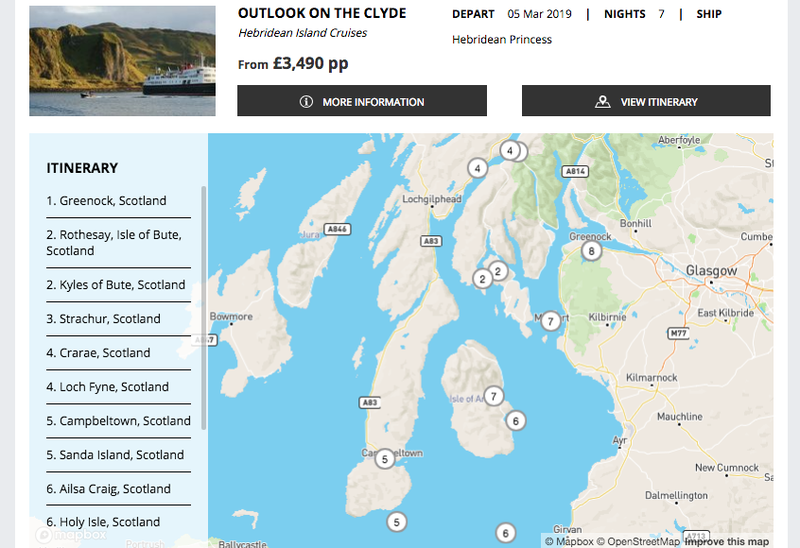 We hope to have greater coverage through our partner agents and allowing them to upload our itineraries and pricing information using Widgety makes it easier for agents to work with Hebridean. Q. - In your experience of the industry, what is the critical barrier to a travel agent selling a smaller cruise line? We believe that sound agent training and product awareness are critical to successfully selling smaller, unique ships. At Hebridean, we are committed to providing the trade with in store product training, ship familiarisation tours and marketing collateral that can really make a difference when converting enquiries into sales. Q. - What does Hebridean have planned for the next few years? Over the next few years, Hebridean will continue to source unique and remote destinations in its home waters of the highlands and islands of Scotland and elsewhere in northern Europe, ensuring that its guests are treated to some of the best scenery and destinations not too far away from home. ‘Exclusive Gems’ will continue to feature on our European river cruises programme, providing guests with private tours, receptions and recitals, presenting a uniqueness to some very special visits. Q. - Are there different fare sets, pricing options or anything else that a travel agent will need to understand before selling a cruise? Cruise pricing can be confusing, with a myriad of early booking offers, guaranteed fares and single supplements. At Hebridean, our prices are transparent. The cruise fares shown are what guests pay – and not a penny more. All-inclusive fares mean that guests can travel on our cruises and not require money – other than for going ashore and purchasing gifts to take home to family and friends. Even when visiting places of interest, our guides and tour managers will settle the bill at the local café or tea room. And for solo travellers, we set aside dedicated single cabins, with their own pricing structure, therefore eliminating unwelcome hefty single supplements. Q. - Do you have plans to launch any new ships? We have no current plans to launch any new ships. Q. - Are there any key dates each year when new itineraries and large changes in pricing happen? With so many repeat guests travelling with Hebridean each year, we operate a 3 year rotational ‘out of area’ summer cruise programme on board Hebridean Princess. During a window of 6 to 8 weeks we venture out of Scottish waters to destinations such as the south coast of England, Isles of Scilly, the Channel Islands, Northern France, Belgium and Norway. Also during the summer, our European river cruises programme on board MS Royal Crown, offers guests the opportunity to travel further afield safe in the knowledge that Hebridean is looking after them in revered comfort and style. Q. - How often do your brochures change and will these always be available in print for travel agents? Q. - Are there any trade resources available to an agent? Marketing collateral is always available for trade enquiries, in the form of posters, merchandise, agent friendly mailers and flyers. Training presentations are also carried out by our Business Development Manager, Hannah Cockell. Cruise brochures on Hebridean’s Facebook page. Q. - If a travel agent wants to start selling Hebridean what are the steps they would take to do so? Do they book direct with you or elsewhere? It’s very simple. They just need to get in contact with us by phone, email or via our website – we can set them up in our system and ensure that they are kept up to date with any special offers and latest news. Q. - What is the advantage to you of an integration with Widgety? Why have you partnered with us? With many of our partners already using Widgety, this is a great opportunity for Hebridean to continually keep the trade abreast of our latest products, itineraries, prices and cabin availability. Our partnership with Widgety ensures that up to date information is fed across trade websites as one process, meaning that consistent information is provided to the market place and potential customers. Q. - Widgety has built all our widgets to work on Facebook. How important is social media in talking to travel agents but also managing your brand directly with consumers? Social media is a vital tool for communicating with travel agents and direct customers alike in order to increase brand awareness, inform and engage. Facebook is also an important source of referral traffic to our website and improving SEO ratings and it is great that the Widgety widget allows our brochures to be viewed online via this channel. Q. 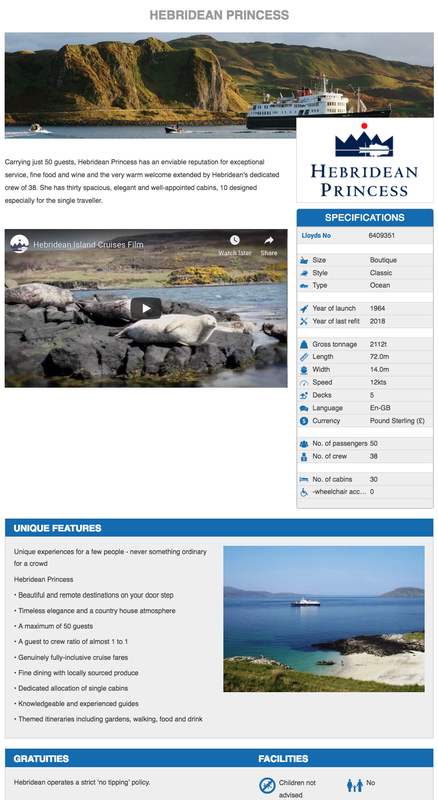 - What can a traveller expect from a Hebridean Island Cruise, and who should go on one? There is a world of difference between an ordinary holiday and a memorable one – at Hebridean we create unique experiences for a few people – never something ordinary for a crowd. Synonymous with luxury cruising for 30 years, we have established a reputation for the highest standards and attention to detail. So for clients seeking an utterly relaxing and cosseting cruising experience, venturing to off the beaten track destinations and offering exclusivity, we look forward to welcoming them on board. Q. - Lastly, what's your favourite thing about the cruise industry, especially about small ship cruising? The cruise industry has to be one of the most diverse holiday experiences that anyone can enjoy. Whether you’re holidaying as a family, as a single traveller or as an adventurer, there is a cruise line out there to suit your requirements – and this is what makes this industry unique. Hebridean is one of the very smallest cruise lines – and especially enchanting – at Hebridean we know our guests by name, by voice and by their requirements and it is getting to know customers at this level that makes working for small ship cruising very special indeed. Thanks so much for talking to us, Jonathan! If you are a travel agent interested in selling Hebridean, you can contact them at enquiries@hebridean.co.uk or 01756 704704. Or, you can find all the ship information and cruises on our Cruise Search, Ship iFrames or through our API.